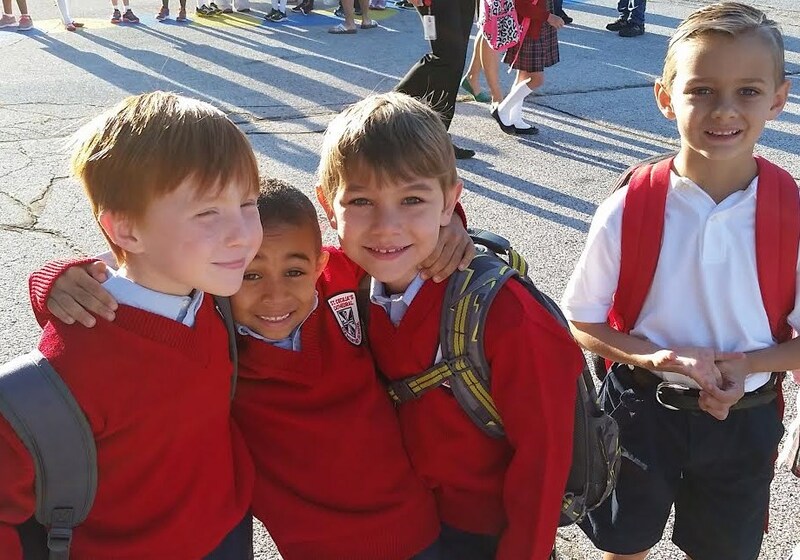 At St. Cecilia Cathedral School, we take pride in working more closely with our students which means smaller classes. St. Cecilia School has a student to certified teacher ratio of 14:1 and a student to computer ratio of 2:1. We also provide dozens of extra-curricular opportunities for our students. Tuition Payment Plan forms are required each year to indicate your payment plan for the year. You may choose to pay monthly, quarterly, or yearly. See form below. Families who may qualify for Free/Reduced Lunch need to complete this application form and turn into the school office. All families receive a personal login for for Sycamore (www.sycamoreeducation.com), our online school information site. On this site you will be able to find your child’s room assignment, view your tuition and cafeteria account information, as well as enter your volunteer hours into your service log. Parents of students in grades 4 - 8 will be able to view student academic grades as well. St. Cecilia School Uniforms may be purchased at DiGiorgio's Sportswear located at 14111 Q St, Omaha, NE 68137. Their website is www.digiorgios.com. You can find detailed information regarding the school dress code in the Family Handbook. Changes for 2018 - 2019 - PreK - 3rd Grade: Girls can wear the traditional jumper OR the new skort in the red plaid. Grades 4 -8: Girls can wear the new skort or skirt in the new red plaid. There are no uniform changes for boys. Please consider volunteering in our cafeteria. We welcome both parents and grandparents and hope you will find it to be a very rewarding experience. It is an opportunity to see your student at school and they are excited to see you as well! Hot lunch is provided daily in the cafeteria through the Westside Community School Lunch Program. The cost is $3.25 per lunch. Free or reduced lunch applications are available from the cafeteria manager, Mrs. Cindy Sheridan. All other school and parish balances must be in good standing (current or paid in full), which includes current and past tuition, lunch balances, and other school fees such as library fines, etc. When the forms have been completed and the $200 registration fee (per family) has been submitted, we will verify that all other school and parish balances are in good standing. Once confirmed by the parish administration office, you will be notified by school administration that your child(ren) will be accepted for enrollment for the 2019-2020 school year. If your family resides in the Omaha Public School District, complete one form per student to inform OPS that your child is attending an accredited school. St. Cecilia Parish offers limited Tuition Assistance to those families that demonstrate financial need. To apply for this assistance, please contact the school office to request a Tuition Assistance Application. Located adjacent to the grade school, St. Cecilia Child Care is licensed for children 6 weeks to 13 years. With close access to a fenced-in playground, sports field, the children have a wonderful opportunity for gross motor skills. We offer activities for social and cognitive development in our entire curriculum. Language, math, creative art, dramatic play, singing, pre-writing and other “learning through play” activities are taught by our qualified trained staff in a warm, safe, loving and child-friendly environment. Hours of operation are M-F, 6:30 A.M. to 6:00 P.M. We are closed for holidays and snow days. For further information contact Betsy Herlacher or Denise Leibert, Child Care Directors, at 402-553-1708. Extended Care is a before and after school program for K-8 students of St. Cecilia School. Breakfast and an afternoon snack are provided. Extended Care services, provided through the St. Cecilia Child Care, are available before school from 6:30 a.m. and after school until 6:00 p.m.
Care is also provided on no school days, winter and spring break, and during the summer. The St. Cecilia Home & School Association is under the leadership of a board that consists of a group of parent volunteers. In conjunction with volunteer committee chairs, the Association strives to improve upon and support St. Cecilia Cathedral School through communication, fundraising, and community service, as well as establishing a constructive partnership with the teachers and staff. The Home & School is committed to promoting school spirit and enthusiasm through parental involvement in various school and social activities. In addition, the St. Cecilia Home & School Association does many things to foster a partnership with the faculty and staff. Some of the Home & School programs include: selling St. Cecilia apparel and spirit items, Back to School Picnic / Movie Night, Dine Out Nights, and an annual Garage Sale. The Home & School also assists with health screenings, organizes a Christmas fund drive, and provides First Friday treats and special day meals for the teachers. Parents are encouraged to get involved by volunteering to help with an event or join a committee. Activities Booster Club is a service organization that supports the extracurricular activities of the students of St. Cecilia Cathedral School as well as a number of unanticipated needs of the school. ABC supports a broad spectrum of activities ranging from after school academic programs and competitions, Accelerated Reader program, athletics, field trips and bus fees, music programs, robotics, and high school scholarships. Additionally, ABC provides the parish with social events such as parish breakfasts and the 8th Grade Banquet. ABC raises money to support these activities by sponsoring the Red Wheel fundraiser and running the concession stand at athletic events. We are always looking for volunteers who would be interested in becoming part of the leadership of ABC or helping out with some of the events that we sponsor. The St. Cecilia Board of Education assists the pastor and principal with the development of educational programs at St. Cecilia School. The board is advisory to the administration. 2. Register for an online account or login. 4. Select St. Cecilia Cathedral School as your designated organization. 1. Collect receipts from Family Fare stores and turn them in. 2. The school will receive $1000 for every $150,000 in receipts we collect! 1. Download the app on your phone. 2. Checkout the list of participating businesses who will donate 5% of each purchase you TAGG at checkout. 1. When you shop at smile.amazon.com, you’ll find the exact same low prices, vast selection and convenient shopping experience as Amazon.com, with the added bonus that Amazon will donate a portion of the purchase price to our parish. 2. Select Saint Cecilia Cathedral as your designated organization. Hy-Vee receipts from Sept. - Dec.